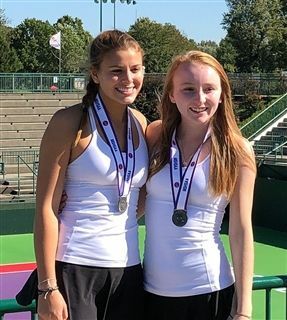 Hannah Tadros and Helene Bergere take 2nd in Class 1 Missouri State Doubles Tennis Championships. 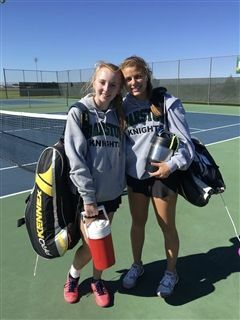 The doubles team of Hannah Tadros and Helene Bergere competed in State competition on October 19 & 20 at the Cooper Tennis Complex in Springfield, MO. Read all about their journey to the championship match below. Barstow seniors Hannah Tadros and Helene Bergere started off the morning in Springfield with some amazing tennis. 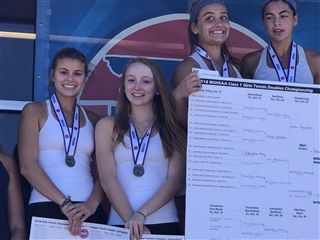 Facing a doubles team fom the just crowned 2018 Team State Championship, John Burroughs of St. Louis, Hannah and Helene brought their best tennis of the year. The entire Burroughs squad had not dropped a single match through the entire two weeks heading into this first round. Hannah and Helene took total control of net, stealing Burroughs strong returns and groundstrokes with solid volleys and won the set 6-4. Burroughs fought back to dominate the second set, 6-1 setting up the decisive, nailbiting 10 point MATCH tiebreaker. The doubles teams traded points until 6-all, when the Lady Knights rolled off three strong points at the net and went on to win the tiebreaker and move on to the quarterfinals. 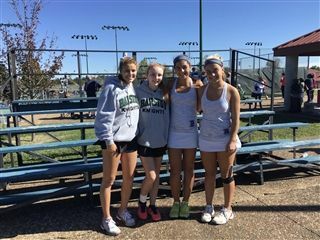 In the quarters, Hannah and Helene faced an equally tough MIDCS doubles team. The girls with Helene providing strong groundstrokes and Hannah sweeping volleys at net swapped the lead back and forth. Down 5-6, the Lady Knights broke serve to push the first set into a SET tiebreaker (to 7 points). The girls roared to a 4-0 lead when Helene went down hard on a rolled ankle. With the trainers help and a complete tape job during the injury time out, Helene was able to continue and the girls held on for a 7-6 (7-5) first set win. This time MICDS roared back to take the second set decisively 6-3, again setting up their third tiebreaker of the day and their fourth of the two week state tournament. Both teams exchanged points until the Knights gained the 9-7 lead, just a point away. Helene moved on a floater and put the shot away, but unfortunately ticked the net, giving Burroughs the point, score 9-8. Burroughs won the point with a huge serve to tie at 9-9. From the duece corurt Helene took another strong Burroughs first serve and laced a winner cross court, leaving Hannah to finish off the set and match after a long exchange from baseline, the Lady Knights winning, 7-7 (7-5), 3-6, (11-9). The girls take on Sprngfield Catholic in the State Semifinals tomorrow morning at 9:00. Congratulations ladies, a brave and amazing day! Hannah Tadros and Helene Bergere won again Saturday morning defeating Springfield Catholic 6-2, 6-4. The Lady Knights Took control early with solid back court play and a strong net game to jump out to go 5Dash 0 lead and closed at 6-2 in the first set. After a slow start in the second set the girls ran together for straight games for a five Dash two lead and held on to win The second set 6-4. The Glass slipper finally fell off Saturday afternoon as The Cinderella surprise of 2018 Missouri Class 1 doubles. Hannah Tadros and Helene Bergere fell In the championship round to John Burroughs. The Burroughs doubles team consisted of the two previous state singles champions to form a powerful combination. The first three games each went back-and-forth with Burroughs grabbing a 2-1 lead. 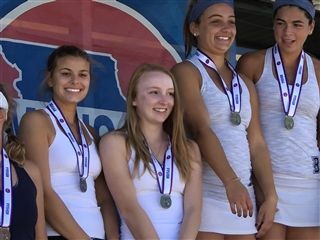 But the huge serves and big ground strokes of Burroughs were too much to overcome, and the Lady Knights had to settle for second place with the 1-6, 2-6 loss which does not diminish the amazing district, sectional, and state tournament run that Hannah and Helene made. 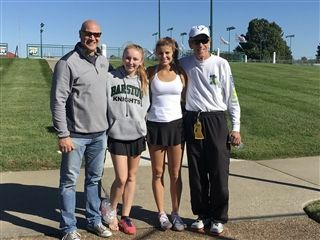 Facing underdog status in three consecutive matches, winning four of four tiebreakers, Hannah and Helene fought through the toughest draw in recent years to reach the finals of the Class 1 Missouri state tennis championships. Congratulations to these two young ladies for an exciting two weeks and a terrific year.